Attorney Ann Lodolce of LoDolce Family Law specializes exclusively in the field of Divorce Mediation. Over the past 35 years she has earned an outstanding reputation serving clients. 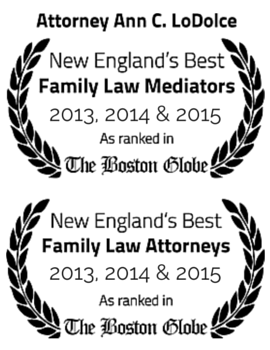 Ann LoDolce is ranked in the very top percent of all lawyers nationwide in the specialized field of Family Law Mediation. Ranked by her legal peers, Ann Lodolce was awarded a coveted “AV” rating from Martindale-Hubbell. Ann LoDolce has, with dignity yet fierce tenacity, guided her clients through their painful legal proceedings with impeccable attention to detail, meticulous case management and zealous advocacy and now focuses on dispute resolution in the same way.